Bacteria are everywhere in our environment. They are abundant in air, water and soil; in and on animals; on plant surfaces; on man-made surfaces and in indoor environments. Most naturally occurring bacteria do not cause illness in humans. 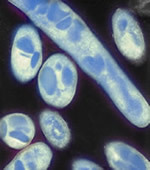 Some types of bacteria, such as Legionella pneumophila, may cause illness. Bacterial infection in humans may occur from contact, inhalation and ingestion. The resulting infection may cause asthma, fever, chills, respiratory infection, pneumonia, hypersensitivity pneumonitis, and other diseases. Additionally, bacteria can play an important role in the deterioration of building material, offensive odors, and building-related sicknesses. Forensic Analytical Laboratories offers a wide variety of bacteria laboratory services to those seeking to identify bacterial contamination of air, building materials, and/or water. We also provide specialized media for bacteria sampling. In addition to these services, Forensic Analytical Laboratories provides analysis of environmental endotoxins associated with Gram-negative bacteria. Endotoxins have been implicated in a number of adverse health effects, both acute and chronic. This includes respiratory problems, fever, and malaise. As holding times for bacteria samples are extremely short, it is important that samples are submitted to the laboratory within 24 to 48 hours of collection and shipped on ice (with the exception of samples for Legionella analysis, which should be shipped at room temperature). Standard turnaround times for most tests are three to five days. Please call the laboratory if you have any questions about appropriate media, how to sample, or how to ship samples.